Gazpacho Recipe, it is easy and nutritious! Anyone can blend together fresh veggies and herbs to make an amazing cold soup! Yes, cold soup! Gazpacho is a refreshing cold soup packed with vitamins from fresh veggies! This is a low-carb soup that makes an awesome meal or appetizer! Gazpacho is a wonderful soup packed with nutrition. It’s refreshing and delicious! On a hot, hot summer day, after work, gardening, or taking a long walk on the beach, coming home to a healthy meal is at the top of my list! Considering the abundance of garden and farmers market veggies, this easy cold soup is top of the must make soups! Why is Gazpacho Soup a cold soup and where did the soup originate? Gazpacho has origins in Spain and Portugal. The soup is served cold as it is said to have been a nutritious everyday meal to replenish their bodies for local farmers after working on their farms. Can you eat Gazpacho hot? I personally love my Gazpacho recipe served as it originated, cold. If I want a warm soup, I would do a tomato soup( I have an Instant Pot recipe coming next week) with sauteed veggies as the base. Gazpacho incorporates veggies and herbs fresh so I prefer it served cold. How do you serve this Easy Gazpacho Soup? 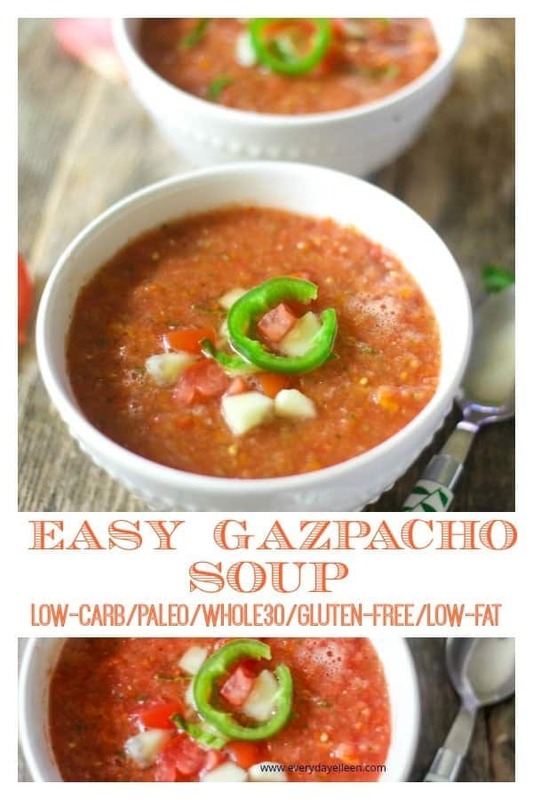 Easy Gazpacho recipe is a great cold soup to serve in soup bowls. For a special presentation, I hollow out peppers and add the chilled soup. This I do ahead of time and keep in the fridge. Sprinkle extra cucumber, tomatoes, celery on top of the cold soup. Avocado is also a great topping as it pairs well with all the garden veggie ingredients. An awesome topper, a jalapeno slice if you like a little heat. Freshly baked croutons or Parmesan Crisps are great additions too! Please don’t freeze. It is a cold soup is made of fresh veggies, freezing the soup will lose the texture of the fresh veggies. This soup will keep well covered in the fridge for about 3-4 days. 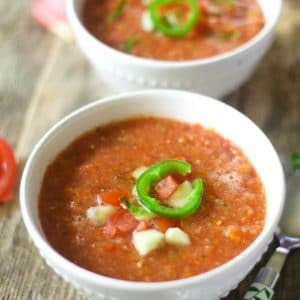 What can I serve with this Easy Gazpacho Soup? Serve this refreshing cold soup with a brunch is awesome. Pairing with omelets and quiche are great. Parmesan Crisps, grilled cheese sandwich. Should I peel the tomatoes before adding to Gazpacho Soup Recipe? A huge question and it is more personal. I love soup and I happen to prefer a soup with more texture when eating this one, so I don’t peel and no one has complained. I don’t like extra work when cooking and the cold vegetable soup is delicious with unpeeled tomatoes. I need to mention, traditional Gazpacho calls for bread as an addition. I experimented with bread and found leaving it out was best. This Gazpacho Soup is a bit thicker because peeling tomatoes or putting the veggies through a sieve is not required so the soup has texture. Besides making this gluten-free, the fresh flavors of the veggies were perfect. It also is keeping this a low-carb meal and its a perfect for those doing Keto! The amazing Festive Foodies Group of food bloggers are gathering to share their best Farmers Market recipes this week! A special thank you to Family Around the Table for hostessing this event! Into a blender add the cut tomatoes, celery, pepper, Vidalia onion, garlic, olive oil, Balsamic vinegar, Worsheshire sauce, fresh basil, oregano, salt, and pepper. ( all the ingredients) Blend well. Check the seasonings. Adjust if needed. Place the juice in the fridge to cool. At least 2 hours. Serve in bowls and garnish with chopped cucumber, celery, and jalapeno. LOVE SEEING AND SHARING YOUR CREATIONS! WHEN YOU MAKE THIS RECIPE, I’D LOVE TO SEE IT. Enjoying my Gazpacho Recipe, giving it a 5-star rating and share comments below would be super helpful! Gazpacho is a cold soup recipe made with fresh tomatoes and other fresh garden veggies and herbs. Served cold, this is a thirst quenching soup filled with flavor and healthy ingredients! Into a blender, add the tomatoes, cucumber, bell pepper, onion, jalapeno, garlic, balsamic vinegar, olive oil, salt, and pepper. Blend well. Check the seasonings of the Gazpacho, adjust if needed. Refrigerate soup for at least 30 minutes. Serve in bowls and top with diced cucumber, tomatoes, onions, or a jalapeno. An avocado is also awesome as a garnish. I will explain once the admin accepts you okay? I have never made gazpacho! I’ve had it a few times, but never made it. Definitely putting this on the menu! The perfect dinner for this 90+ degree temps we’ve had! Love the look of this soup! Definitely trying it soon! It’s been eons since I’ve made gazpacho – I had forgotten how much I enjoyed it this time of year. I’m going to have to make it again, and steal your cute little jalapeno garnish idea! I love gazpacho but have never made it. I have all of the ingredients, I think I will be making it real soon! Awesome Anne! Let me know how your gazpacho turns out! 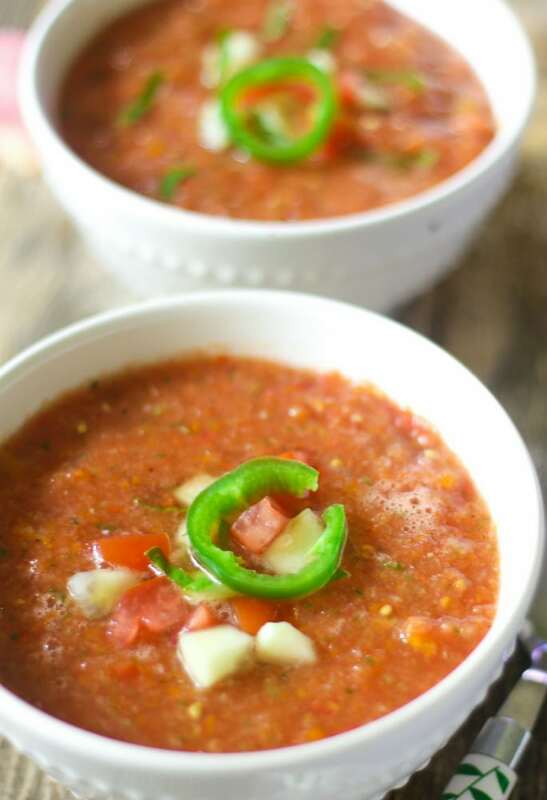 It’s been eons since I’ve made or eaten gazpacho – time to get in the kitchen and change that! And that jalapeno garnish – love it! Perfectly cooling for hot summer days! I bet my kids would love this! This looks delicious and so easy to make! I can’t believe I’ve never made gazpacho before! Valentina, Gazpacho is a must make. Enjoy the recipe on a hot summer night, you won’t regret it. This gazpacho is so beautiful. Love the Q&A! 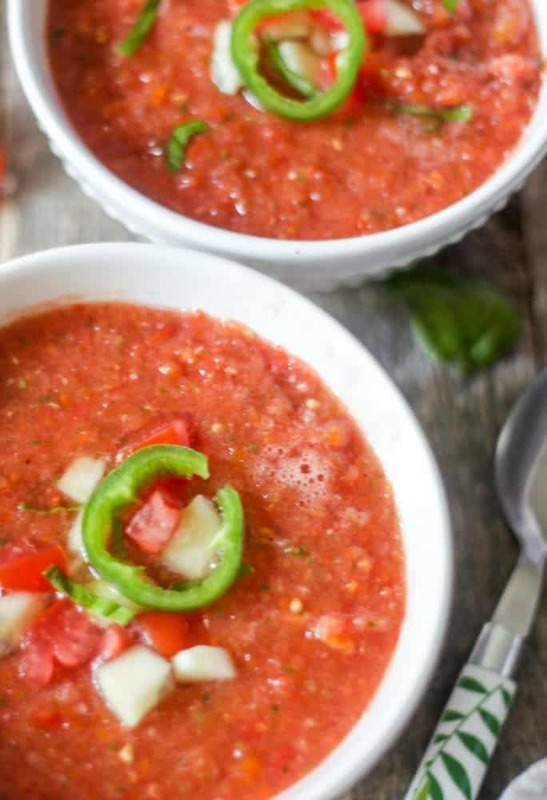 Gazpacho is a favorite, perfect for summer! This is just the perfect summer meal ! Using summer veggies doesn’t get easier than this! It’s a great way to make sure none of them go to waste! What a flavorful bowl full of summer! Gazpacho is such a great way to enjoy them during the heat too. I also like serving gazpacho shooters. They are a lot of fun, especially at large gatherings.